A team from Florida Atlantic University (FAU) has developed a novel approach to identifying and removing cancer — while leaving the healthy tissues behind. The technique combines a CO2 laser to ablates skin cancer cells with a Raman spectrometer to distinguish between cancer and healthy tissues with high accuracy, enabling surgeons to determine when the cancer has been completely ablated. The breakthrough could eventually pave the way to automated skin cancer surgery. Traditionally, surgeons have relied on their eyes and sense of feel to differentiate between cancer and healthy tissue. This often leads to a wider margin of healthy tissue being removed than necessary to ensure that no cancer tissue remains. A new approach for skin cancer treatment called Mohs micrographic surgery provides much higher cure rates while removing the least amount of healthy tissue. Unfortunately, Mohs surgery is a lengthy procedure that requires the surgeon to perform many different activities. Using a microscope, the approach enables intra-operative histology to be performed, ensuring the cancer is removed at its roots. The new technique developed by FAU researchers uses a CO2 laser, but also includes Raman spectroscopy to analyze the tissue being treated, according to a recent press release from the university. Raman spectroscopy analysis objectively and non-destructively probes the tissue after laser ablation to determine if the partially ablated tissue that remains is cancerous or healthy. The spectroscopic approach can distinguish cancer tissue from healthy tissue with 95% sensitivity and 100% specificity. The primary biochemical difference between the two tissues is the absence of collagen in cancerous tissue, according to a recent study published by the team in Lasers in Surgery and Medicine. Healthy tissue has high levels of collagen, and even when partially ablated by the laser, this component is apparent with Raman analysis. 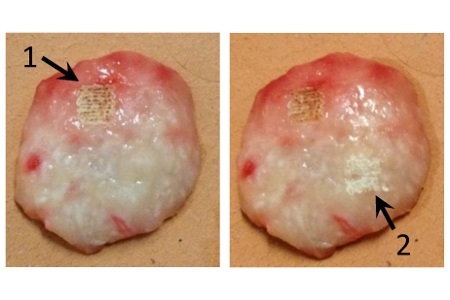 This development could have a significant impact on how skin cancer ablation is performed. “Successful clinical implementation of the proposed surgical method could greatly enhance the speed and effectiveness of skin cancer treatment, especially if real-time analysis of the process were developed,” said Andrew C. Terentis, Ph.D., lead scientist of the study and an associate professor of chemistry and biochemistry in FAU’s Charles E. Schmidt College of Science. As the aging population grows, the importance of treating skin cancers and melanomas is becoming increasingly important. To address this researchers are also examining non-invasive diagnostic methods that use photoacoustics to analyze skin cancers.